When I came to Vietnam, I overcame my aversion to breakfast. These days there would be a dietary intolerance or a term to describe the kind of antipathy I felt when I was younger. All those tedious mornings as a child, dwelling over milk, cereal and toast followed by the teenage rebellion of bypassing breakfast for more shut-eye meant that - except for special weekend brunches of cooked morning fare - I was rarely eating anything substantial before noon. Today I leap out of bed to noodles and rice in renditions too numerous to name. Taken street-side, the siblings and parents of my younger self replaced as eating companions by the teeming populous of a whole city, these breakfasts are at a different end of the palate spectrum, unequivocally savoury, umami-rich, with protein, carbs and vegetables all in evidence. There will be onions and herbs, maybe cucumber. I can add vinegar or garlic or chili or fish sauce or lime at the table. It's right up my taste bud alley and any indifference to morning food is long gone. 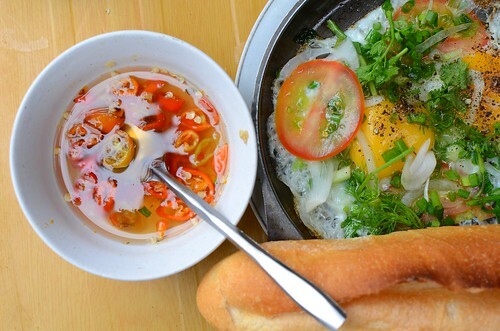 In Hue not long ago, I was canvassing breakfast options and amongst the rice and noodle dishes there was egg and bread. 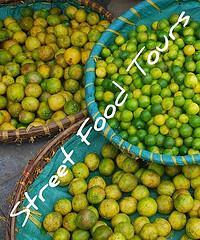 This is borrowed food culture, of course introduced during the French colonial period. It's a variant of eggs on toast, eaten less regularly than a rice-based breakfast, probably in similar frequency to the cooked breakfasts of my youth. Eggs are not scrambled or often poached in Vietnam, though it is possible in Hanoi to have an egg yolk coddled momentarily in broth and added to a morning bowl of phở. Steamed and enveloped in a rice flour crepe is another egg alternative at Hanoi's bánh cuốn vendors. But with this egg breakfast in Hue, and in general in Vietnam, eggs are fried intact (ốp la) or whisked briefly into an omelette (ốp lết) and served with or in a bánh mì (baguette) warmed to just crisp. Here, I forked mouthfuls of egg into cottony wads of baguette, each time managing to manipulate the spicy nước chấm and herb, onion and tomato garnish into the equation. It's a distinctly Vietnamese way to approach a breakfast standard, fused with the French bread legacy and very much aligned with my food leanings in the morning. 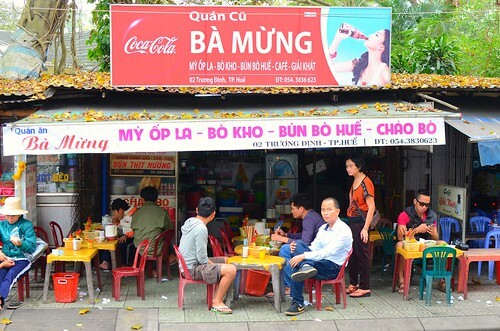 One of my favourite Huế breakfasts, and on my favourite street for it too. Trương Định has several little places that all serve eggs and baguette for breakfast. I just put up a post on eggs too. Was planning to talk about these and other Vietnamese egg dishes, but ended up concentrating on hột vịt lộn instead. I think I'll add a link to your post here to broaden the scope. Your posts of late have, how can I say, 'matured'. Are we getting reflective in old age??? I was like you. No breakfast to speak of from teenage years through to mid-20's I reckon. Chris - I enjoyed your musings on the divisive trung vit lon - and thanks for the link. Graham - I'll take that as a compliment ;-) Breakfast in Asia was a revelation to me!